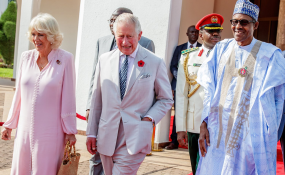 Abuja — The Prince of Wales and heir to the British throne, Prince Charles; and his wife, the Duchess of Cornwall, Camilla, have arrived Abuja for a three day visit to Nigeria. They arrived the Nnamdi Azikiwe International Airport at exactly 1.10pm Tuesday and were received by Senior Nigerian and British officials. Prince Charles and his wife, who are in Nigeria as part of a 9-day tour of some African countries, are expected to meet with the Nigerian President Muhammadu Buhari before meeting with various segments of the Nigerian society including traditional rulers, women and entrepreneurs, among others.